"I had to reinvent myself." “I can do this” is on the lips and in the mind of every successful man and woman who launches a business. Some take the experience of working for others for years and start up in the same field. Some bravely adopt the phrase after suffering the trauma of job loss. Others simply decide that the time is finally right to follow their dream, not just find a job. Northwest Indiana is full of successful small business people whose faith in themselves and work ethic pay dividends in economic self-sufficiency and personal gratification. We salute some here. People told him he was crazy when he opened a fine dining restaurant in a strip mall in the heart of Portage, a city known more for its steel mills than pepper mills. But Ted Zych decided to trust his crazy ideas and opened his popular 50-seat eatery in July 2009. It offers a locally grown, seasonal menu that features free-range chickens, bison, line-caught fish, grass-fed beef and as much organic food as possible while still keeping the pricing affordable. “Good, healthy food is not a fad,” he says. The strip-mall rent was reasonable and the building had a kitchen from a former tenant, so although Ted and his wife Jennifer (a 50-50 owner) spent everything they had, they didn’t have to go into debt. He found another construction job, but also enrolled at Le Cordon Bleu College of Culinary Arts in Chicago, traveling three hours five nights a week for classes. He graduated at the top of his class and earned the President’s Award. A short unpaid externship was required by the program and Zych arranged his with Nicole Bissonnette, chef and owner of Bistro 157 in Valparaiso. He was then hired on and learned how the restaurant and catering business was run. In business only a year and only 33, Zych is already talking expansion. “My goal is in the next few years to open a second and third restaurant,” he says, with St. John the second location in 2011. He’s also mulling over whether to expand Abstract Cafe into adjoining space. Five years ago, Tracy Freeze moved her successful medical-practice management company from Michigan to Burns Harbor, then moved it again to Chesterton in 2009. She has been on the move in many ways since she began managing a psychiatrist’s office in Traverse City, Mich., in 1993. When she needed to leave that job in 1995 to move to southwest Michigan due to her husband’s job, she was asked a question that changed her life. Would she keep on working on a consultant basis? Yes! Her desk and file cabinet went with her. She still has that first client—and that desk. But thanks to hard work and the growing trend toward outsourcing she now serves 31 medical professionals in six states, handling their reimbursement, financial and office management needs with four full-time and two part-time employees. Distance is not a problem. She’s had a client in Florida for two years that she’s never met in person. Always striving to make the physicians’ practices more efficient, Freeze developed a program called Pay My Provider, allowing patients to pay their bills online 24/7 to keep the cash flowing. Her husband, Jeffrey, has been involved in the business part-time from the start, while making his own career changes, first as an investment advisor, then in the automotive industry where his job evaporated with 24 hours’ notice in 2009. The time was right for him to come onboard full-time and he runs the day-to-day business as vice president of operations. For eight years, Hector Cornejo made the daily commute from Merrillville to his job on the north side of Chicago, working for a granite company. When his “I can do this” moment came in 1996, he decided to set up a one-man operation in his garage and became the first marble and granite business in the area. “You have to work hard at something you love,” he says. “If you work at it, the rewards will come.” In October 2009 he celebrated the grand opening of his new 20,000-square-foot building on U.S. 30. It’s not only a very tangible sign of his success, but its high visibility has attracted even more business. Starting out, Cornejo did everything, from fabricating to cutting to installing. He didn’t have the money to buy all the tools his workers use today, but he made do. A year later he built a 1,000-square-foot pole barn on his property to expand his work area, had two employees, and his wife, Gloria, joined the business to do the accounting and billing. He taught her how to handle the pricing for bids and she remains in charge of these areas today as vice president. Growth meant a move to an existing building on U.S. 30 in a shop five times larger and the decision was made to focus on wholesale business, now 80 percent of sales. While new housing construction is down, remodeling of existing homes is up, says Cornejo, which enables Momax to maintain 24 employees and keep his four crews busy with installations. He estimates sales this year will be $3 million. The company earned the 2009 Best of Merrillville Award from the U.S. Commerce Association, which recognizes outstanding local businesses around the country. Sometimes ideas need to percolate for decades before they begin to pick up steam through the right partnerships, technology and timing. 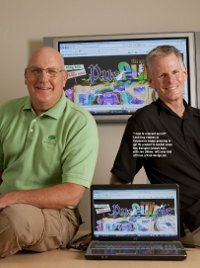 The Land of PurFUNple, a 3D online video game for youngsters ages 5 to 9, is the result of 20-plus years of percolation. It’s the first product of newly formed Click Bug Studios in Valparaiso. The company has four principals: Cindi Blandford, president; Ray Shingler, director of product development/operations; John Carpenter, director of media; and Joe Ubben, director of sales and marketing. Blandford and Shingler work full-time out of their homes; Carpenter and Ubben are part-timers while working other jobs. Carpenter owns a recording studio in Hammond and writes and performs the music for the site, www.purfunple.com. The full-court press to get the product to market began earlier this year when Shingler, 50, was laid off from his job designing Web sites for Fortune 500 clients at a Chicago firm. “I had to reinvent myself,” he says. He also reinvented a video game he worked on years ago, one that was based on a bedtime story his old friend Blandford wrote to teach her children about tolerance and prejudice. It became a 3D experience. It takes place in a land where the pig prince, Pigston, decrees that all things must be purple, and the heroine, Penelope, resists. “Finally the delivery platform and the Web and broadband access and what kids want to do online created this perfect storm,” he says. The immediate focus is raising $250,000 in seed money to get the microsite up by October, let kids hang out for free and let it spread organically while capturing data on its use and growth to lure an additional $700,000 from investors to roll out a commercial site for subscribers. Click Bug Studios is the first Indiana production studio developing a virtual world for kids online, Shingler says. In fact, it’s the only 3D game aimed at the age group. A key player in the kids’ market is Club Penguin (in 2D), which was acquired by Disney in 2007 for $700 million. Looking at that number, it’s easy to see why the company’s goal is a potential movie deal or an acquisition once PurFUNple reaches 250,000 users. The word “service” is often found in retailer’s ads, but nowadays shoppers tend to find it wanting. L.R. Men’s Clothier & Tuxedos surprises. When was the last time a clothing store kept your size and preferences on a card for reference, delivered to your office, or let you take a few shirts home to see which one matched your wife’s outfit? L.R. aims to stand out in the service department, but also wants to differentiate itself from the mall stores in merchandise. Born and raised in LaPorte, VanSchoyck remembers when there were four or five men’s stores in town. Now there’s only L.R. Her knack for retailing and pleasing the customer developed while working at Droege’s in LaPorte, a local institution for 75 years. She worked there for 13 years before it announced it would close in December 2006. “I was at a crossroads,” she says. But almost overnight, after hearing that a chain tuxedo store might locate in the area, she decided to seek financing to start her own men’s store with tux shop. She knew LaPorte couldn’t support two. VanSchoyck used to say, “Oh yeah,” when she heard people say, “Find your passion and you’ll be happy.” Now she knows what they’re talking about.